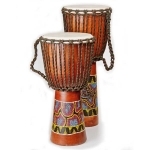 A Djembe is a skin-covered drum meant to be played with bare hands. 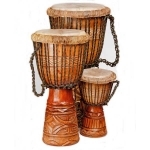 Traditionally crafted Djembe drums were carved from a single section of a Lenge tree and originated in West Africa. Made from hard wood and goat skin they were commonly 60cm in height and 30cm in diameter, but are also made in many smaller sizes. Striking the skin with the palm and fingers toward the drum's centre produces a bass note; striking the skin near the rim produces the ‘tone and slap’. In modern times construction and materials have changed greatly. 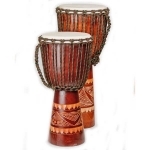 Zensation djembe drums are made in Indonesia and the local hard wood is now used. However, they still have a top quality goats skin and professional quality nylon-core rope in a ‘Rasta’ finish used for toning. As time passes, the skins may need ‘tightening’ and this can be easily achieved by threading the extra rope through the verticals and pulling down hard.